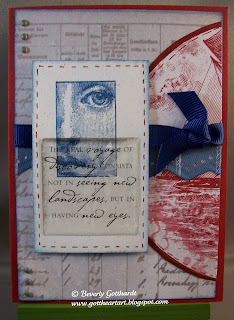 Supplies: Cherry Cobbler card blank 4" X 5 1/2", Papers: Stampin Up-Cherry Cobbler, Naturals white, Designer Series Paper Nautical Expedition, Stamps: Hampton Art-Small Face Frame, Ink: Stampin Up-Not Quite Navy, Stampin Up marker-Cherry Cobbler, Fiskars super size circles template, Cloud 9 Design-Quote stickers, American Traditional Designs-ribbon, Martha Stewart- zig-zag border punch, The Paper Studio Spare Parts-tiny gray brads, Stampin Up dimensionals. I really like this! Such interesting elements that you have combined beautifully...well done! Thank you for playing along with us at Tuesday Morning Sketches! Oohhh so artsy! So very cool!! Thanks for joining us at Tuesday Morning Sketches. 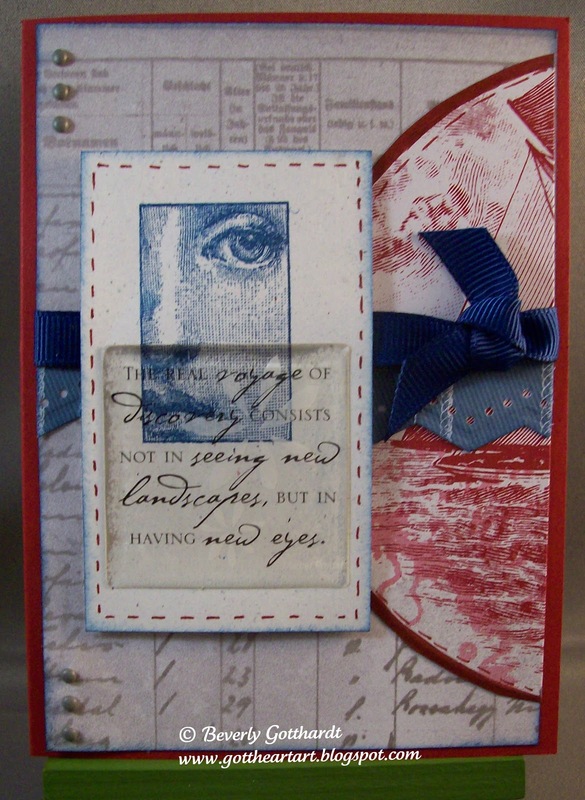 What a lovely eclectic and artisic card. Being a navy wife I sure can appreciate the theme. Thanks for playing along at Tuesday Morning Sketches.